They arrived shortly after breakfast, during the respite between chores and my second cup of coffee. What a pair! Bright eyes bejeweled each precious face; a whisper of animation radiated from each creased smile. Was this a true aura, emanating from the remnants of the prominent role they had played in their owner‘s life? I believe it was. They had returned among the living after a seven-year closet hiatus, bearing memories and blessings to share with everyone. That might not seem long to you, but it was forever to a grieving family. You see, after Mother had passed on to a finer, gentler locale, the two dolls had callously become shrouded in a shock-and-woe blanket. Over the ensuing years, an innocuous event ripped through the family fabric, tearing its fragile foundation to shreds. It all began when Father realized he was quite ill at ease living alone. His children could not provide what his lonely spirit craved: companionship. He ached for the closeness of another human heart, someone who could love him deeply with a caring spirit. This desire eventually found succor in the love of a delightful woman. Remarriage showered his world with peace and joy, slowly releasing grief’s icy grip on his heart. Family and friends visited often, except for his two daughters. The presence of a stepmother had driven a wedge between them. The daughters rumored about that the new mother was throwing out everything their mother had held dear. Withholding their affections and contact with Dad was their way of saying, “We do not like this woman living in our mother’s house and sharing your life.” They stood resolutely in this position…for four long years. The new mother tried to tiptoe around their feelings, disturbing none of their mother’s possessions that remained in the back bedroom, now looked upon as the inner sanctum. She had entered it early on in the marriage and redistributed an assortment of cookbooks that gathered dust in the closet. Some books stayed, some donated to the public library, all with Dad’s oversight and permission. Inevitably, the one cookbook that meant the whole world to the daughters turned up missing. This innocent deed completely severed the final scrap of a relationship left between Dad and daughters. The vagrant book was found later but the damage had been done. Peering through the dim early morning light, new mother’s eyes rested on a doll cradle nestled on the floor near Mother’s vanity. “How precious,” she thought. Stepping closer for further inspection, she spied a life-like doll staring back at her. It was then “Oh my!” escaped from her lips as another cradle, embracing another doll, suddenly appeared in view. 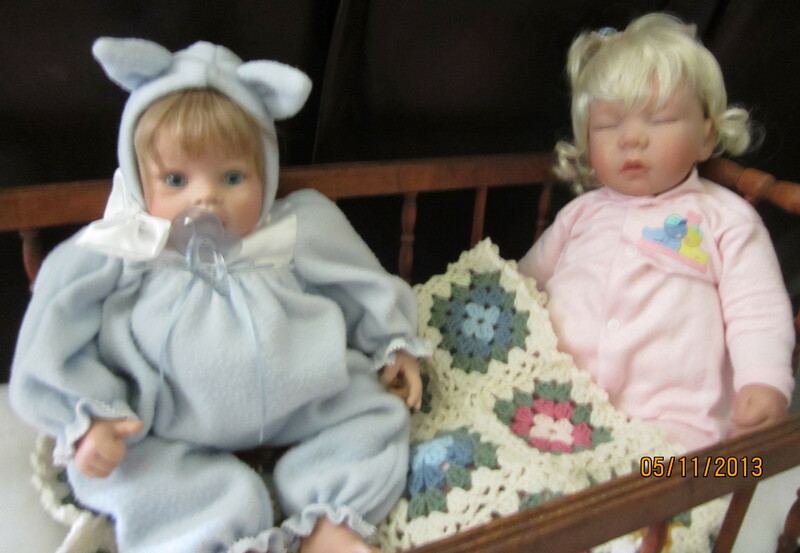 “I think these babies need to get some fresh air and see the light of day,” and with that, she bore them tenderly out of storage and into the living room. Settling them in strategic spots, she stood back and admired these priceless little babes. You see, dear reader, these were special dolls to Mother and, after her own children had left home, they helped ease her loneliness. She had chosen them from a doll shop, opting for hair and skin colors to match her girls. She’d glance over at them as she worked in the bedroom or passed by in the hallway, smiling at them as if they were real, for the time being. Somehow, I believe they too felt they were real. After their special reappearance in the household, things seemed to go better for Father and the new mother. Family members warmed up to Dad’s new wife and found out she wasn’t really a conniving old woman after all. Sure, she would never replace their mother, but they knew she brought joy and love back into their dad’s life. I wonder if the presence of these two little ones somehow triggered forgotten, happy memories within the heart of this family, enabling them to accept the change that had been brought upon them. I would like to think so. This entry was posted in Stories and tagged bedroom, Children, dad, death, dolls, Father, Jeanne E Webster, joy, loneliness, love, memories, mother, remarriage, special, vanity, widower, wife. I found this lovely story and decided to share it with you. It is a reminder to find the “flavor” in a blended family. Thank you, Sametta, for sharing this post from Women’s Window. You are most gracious! I continue to hold you and your family in prayer for ALL your needs. Blessings always, dear one.